I follow a number of steel heading forums and converse with a number of avid steelhead anglers. Steelhead are simply sea - run rainbow trout which return to freshwater to spawn after 2 - 3 years living at sea. Although the same species,I find that whilst in NZ we do not have any true steelhead strains (NZ rainbows arent generally known for visiting the salt), our rainbows exhibit similar behaviour when moving to their spawning grounds from lakes, and within larger river systems themselves. Steelheading tactics sure do work here, so lets look at probably the most basic, yet effective tactic for winter bows. A powerful 7wt rod with a floating line, whether a sink tip such as the Airflo Depthfinder or a longbelly WF, either will do the biz. A longbelly WF such as the EGO has the added advantege of allowing distance roll casting and single handed speys when backcast room is limited, and for when heavier tackle is required. Loaded with a 10’ Airflo polytip this system will allow you to mend if required to adjust your swing, and get you down into the zone. 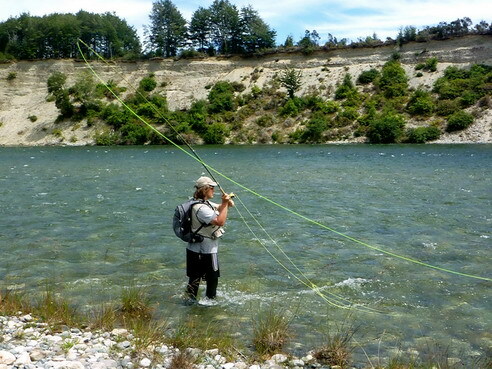 Remember when swinging, the currents work to pull your fly towards the surface on a tight line, and so you may need a heavier tip than expected. Alternatively, an 8wt SWITCH or longer spey rod will make the lifting and casting of heavier tips and big flies easier – just like anything, using two hands makes light work. A skagit head to match and section of T-10 is my preferred set up here. I use a lot of bunny and ‘egg sucking leech’ style flies when swinging, although killer style lures such as Mrs Simpson are popular too. Some subscribe to the ‘Light day, bright fly – dark day, dark fly’ school of thought; have a play and mix it up – see what works for you. 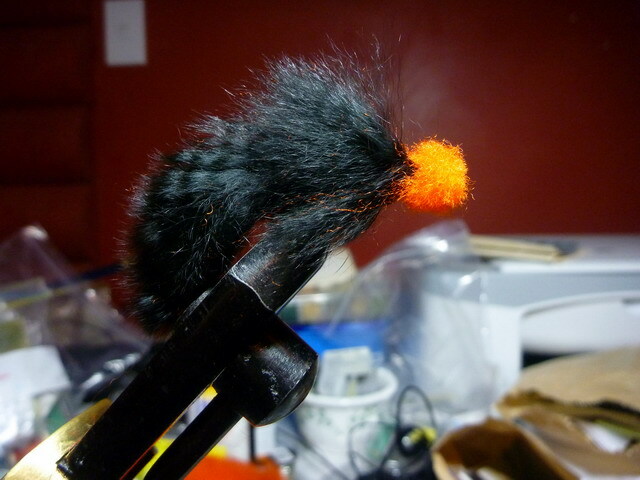 I often tie my winter flies unweighted and rely on the weighted tip to attain depth. This I feel keeps things easy to cast, and gives my flies more movement, even more so if I utilize a lefty’s loop or similar to attach my fly. A heavy, level section of fluro is all I use on the business end – a couple of feet in heavy water or when colour is present, or up to 9’ in clear conditions through the pools. Look for slower water, 2 – 6 feet deep where fish can rest on their journey upstream. Inside bends are always a winner. The first big pool above a series of faster braids is often a sure thing, especially those sporting structure in the way of logs, larger boulders, gravel bars or ledges. Winter Rainbows will often rest on the seam where fast water meets slow, and not just along the main edges either – every decent pocket in behind an obstruction offers two seams – work these carefully. Cast at 45 degrees downstream and mend immediately according to both the currents before you, and wether you wish to speed up, or slow down your swing. Don’t get into a habit of routinely mending the same with each cast – with each presentation you must read the water and the lies you wish to cover, and decide how best to fish them. Try and maintain as straight a line as possible throughout your swing, leading slightly with the rod to absorb the more savage takes. Let the line swing all the way into the bank below you, then give it a couple of quick strips to entice any fish hanging in the vicinity of your fly. Then take two or three paces downstream, pick up your line, and recast. Steelhead will often follow your fly before cutting inside and taking your fly as they return out to their lie. I have found that our rainbows will exhibit the same behaviour, and maintaining a tight line and striking on the pluck will often result in missed fish. By carrying a loop of line behind the trigger finger of your rod hand, you can slip this by moving your rod tip towards shore. 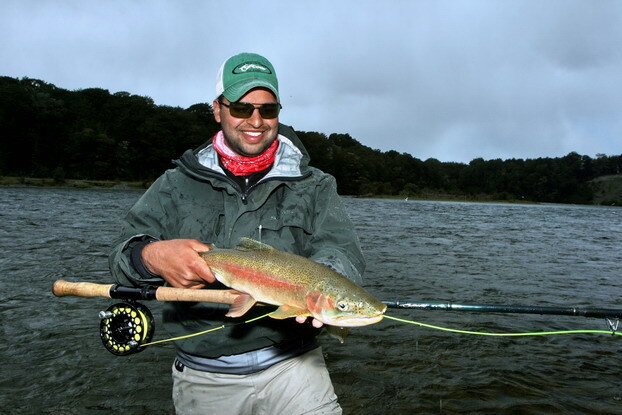 This allows enough slack for the fish to turn and pull the fly into the corner of its mouth, ensuring a true hook-up. A fish that misses your fly can often be enticed into striking again, so if you miss the hit, pick up and get your fly straight back out there. Long casts are not generally required. A cast of 50’ will cover a large arc on the swing. Get out there this winter and take a swing. You can’t get simpler than that! Copyright Chris Dore 2011. All rights reserved.